What is a Domain Island Tour? Focusing on about 50 island domains such as “.cc” and “.tv”, Interlink actually explores these islands first hand to report on the uniqueness and diversity of the islands as well as the domains they operate. 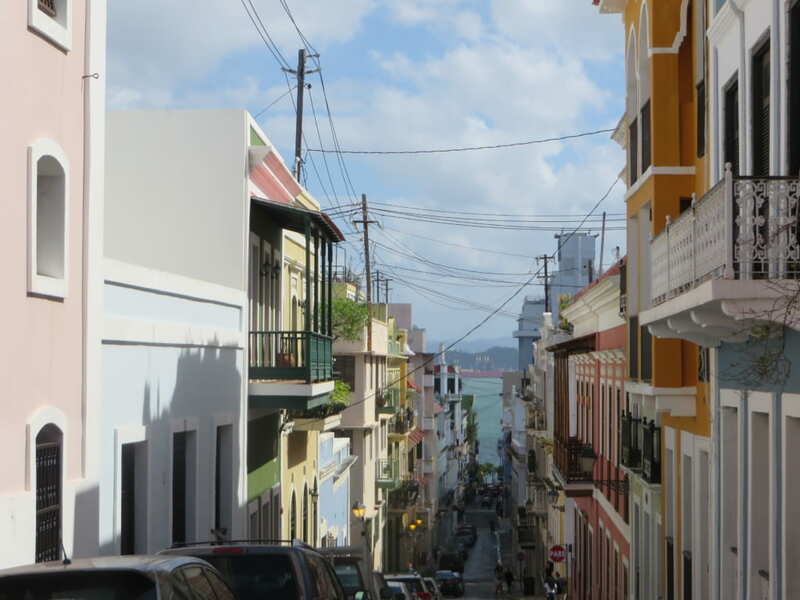 After St. Martin, the island where a plane flew directly over my head, I went to Puerto Rico. 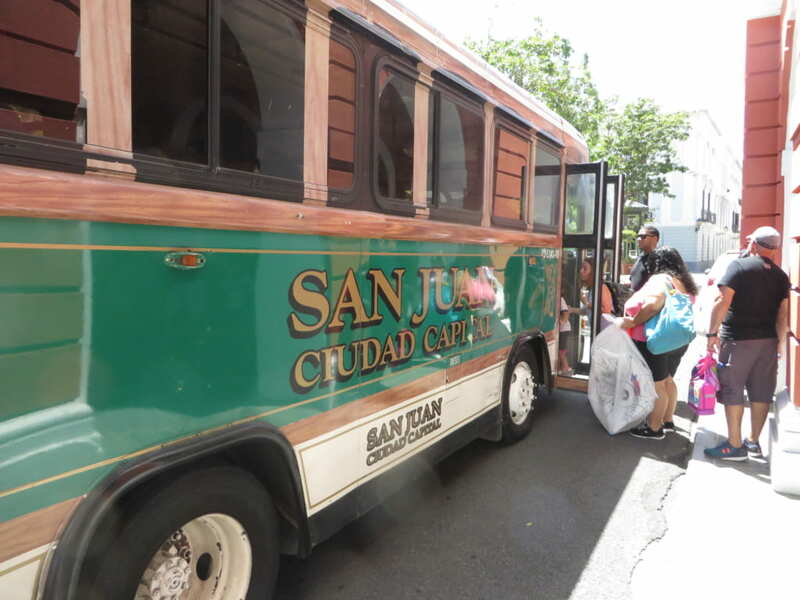 “San Juan” is the biggest city of Puerto Rico and also the seat of government. 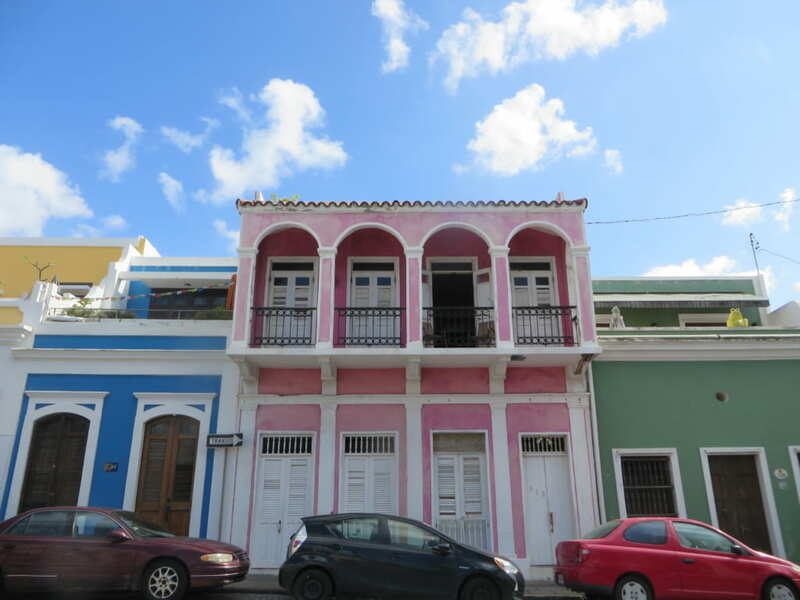 I headed straight for the Viejo San Juan (old town) to see its original 16th century buildings. Made it to the old town. The temperature is about 30°C and the sunlight is very strong. I can feel history among these ordinary homes. What lovely colonial style architecture. The contrast between the sky and the colorful facades! There is a great shot in every direction I point the camera. Next, I’m off to “La Puerta de la Bandera” (The flag gate.) 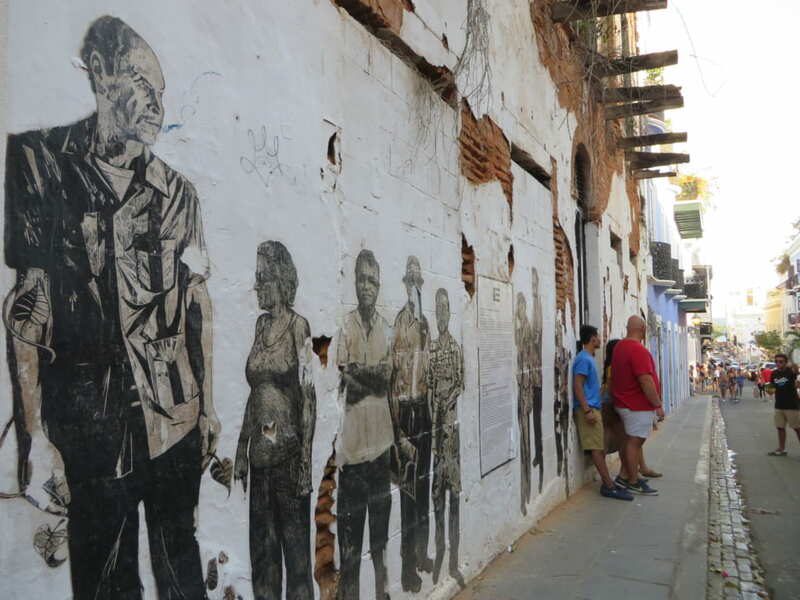 Modern art drawn on the wall of a vacant house by a local artist, now one of the most Instagram-able spots in San Juan. The historic cityscape of the old town, which is designated as UNESCO World Heritage, can be viewed from a free trolley. 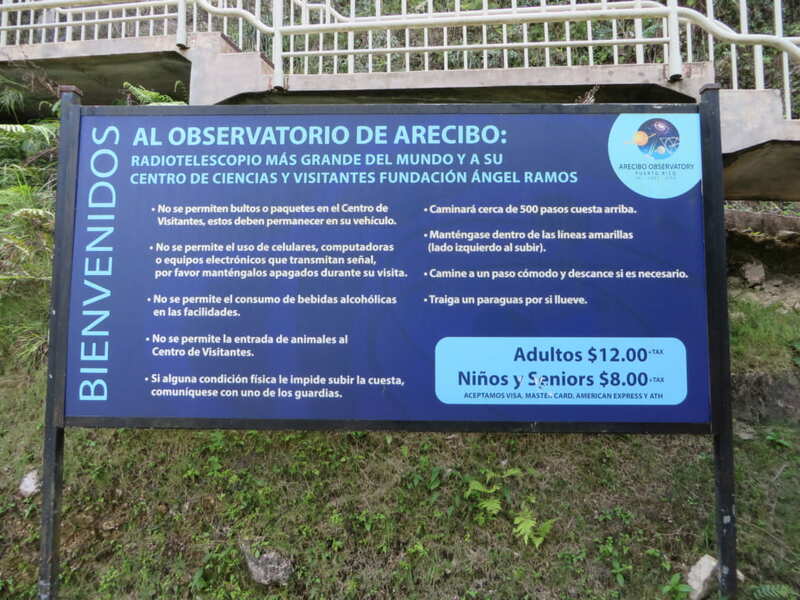 On the outskirts of Puerto Rico there is an “observatory with a huge astronomical telescope”, so I take a taxi from San Juan to go see it. 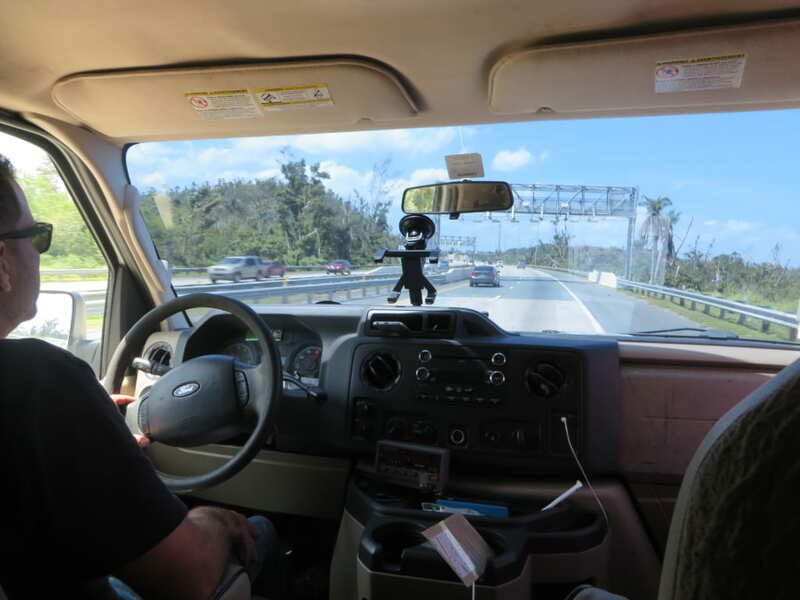 After about an hour riding in the taxi, we arrive in a city called Arecibo. We head down this local road. 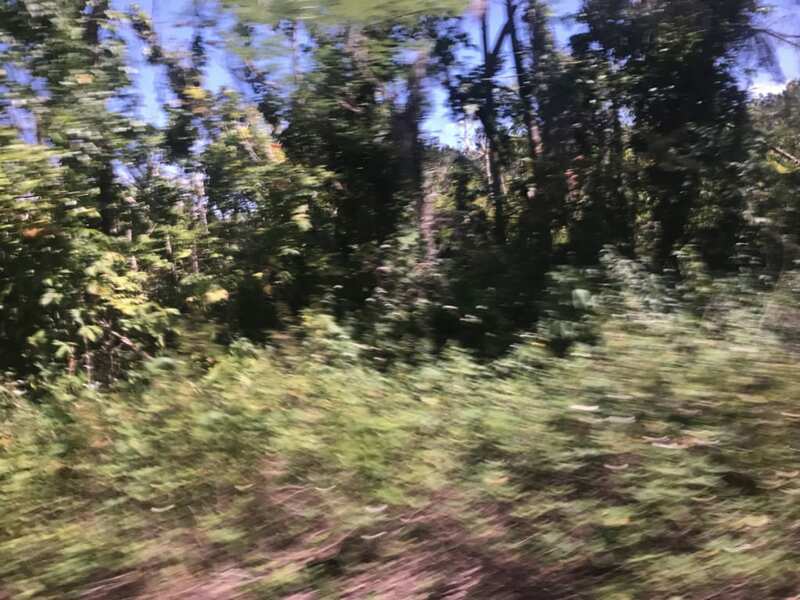 It seemed alright for a while, but the road got narrower and narrower until only one car could pass, we were completely lost. There’s a local man in that pickup truck. 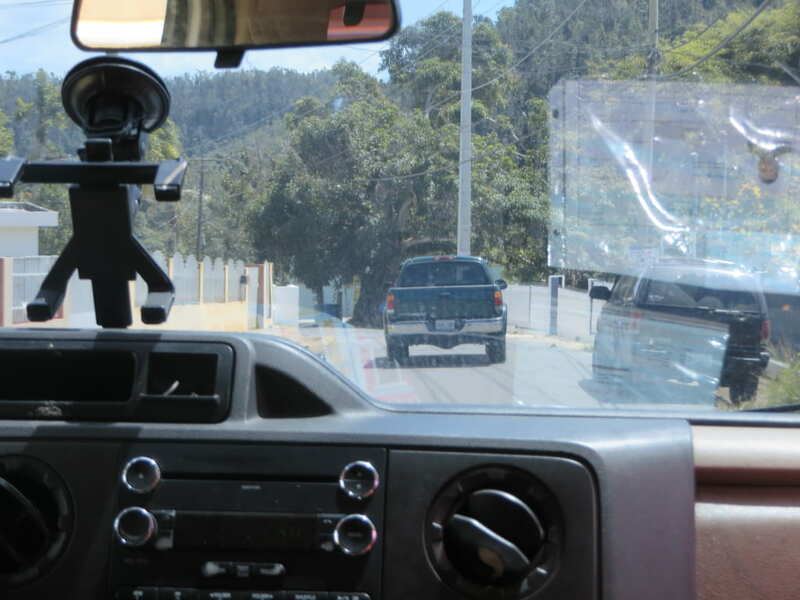 When the we explained that we were lost, he said “follow me amigo!” and lead the way. Thanks to him, we were put back on the right path. Gracias! Then we arrive at gates manned by security guards. 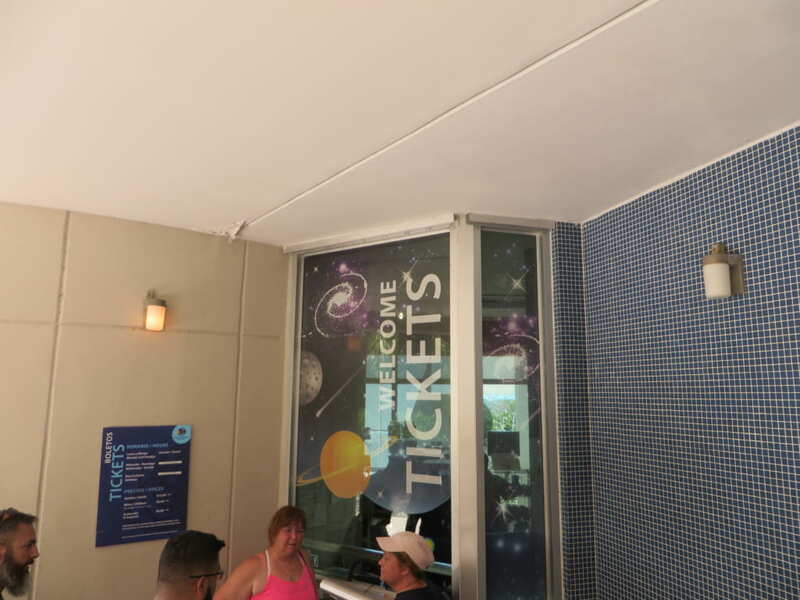 Although photography is prohibited, we were successfully able to penetrate this mysterious facility. There are various things written on this board, is it possibly a warning to intruders? Adults 12 dollars? They try to destroy the spirit of those trying to discover the truth. 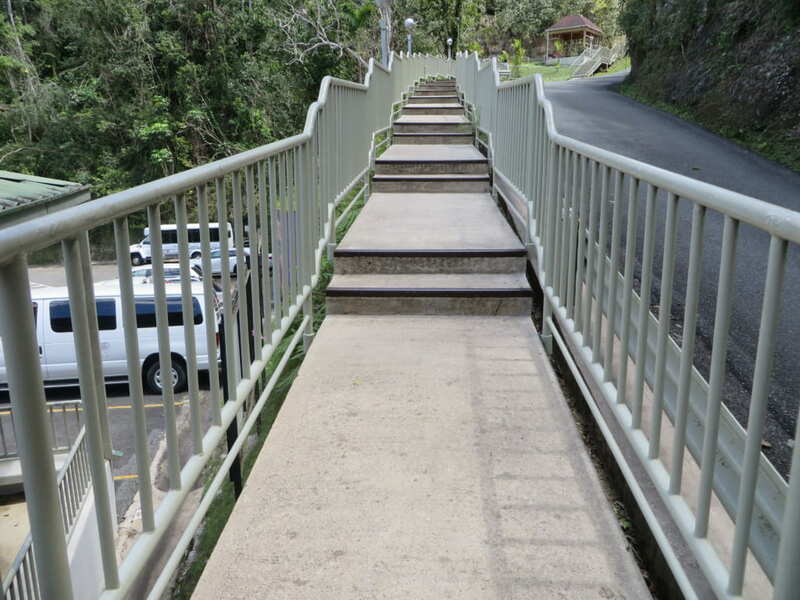 With a long stairwell and then a never-ending hill. I resolutely decided to make it to the top, and soon, some vast object loomed before my eyes. Yes, it must be an unidentified flying object! A UFO floating in the sky, held up by 18 strong cables. This is 5 of them. 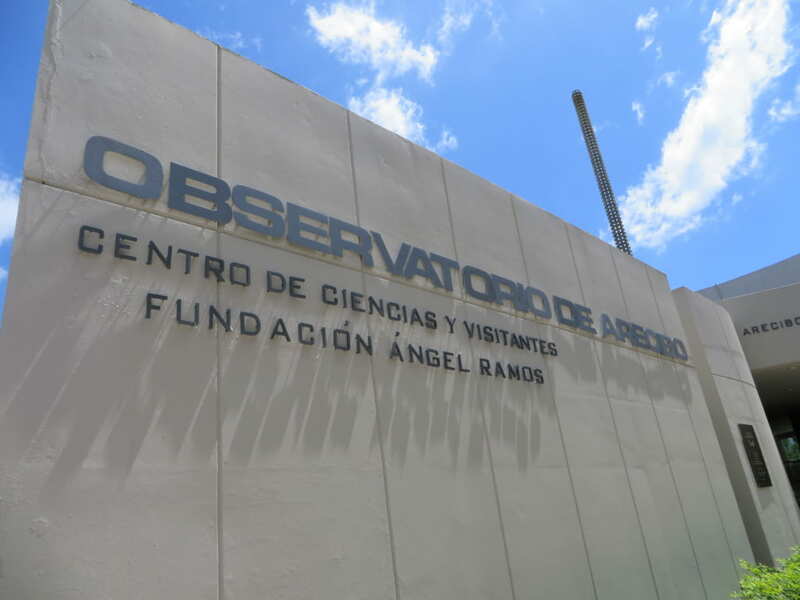 So, I arrived at the area 51 of Puerto Rico, woops, no, it’s a joke, but the “OBSERVATORIO DE ARECIBO”. 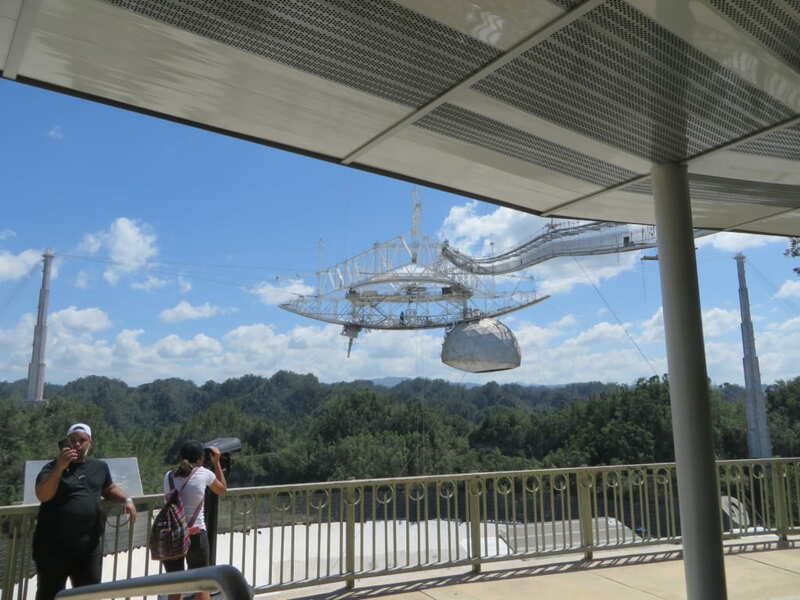 Built in 1963, its famous for having the world’s largest radio telescope. 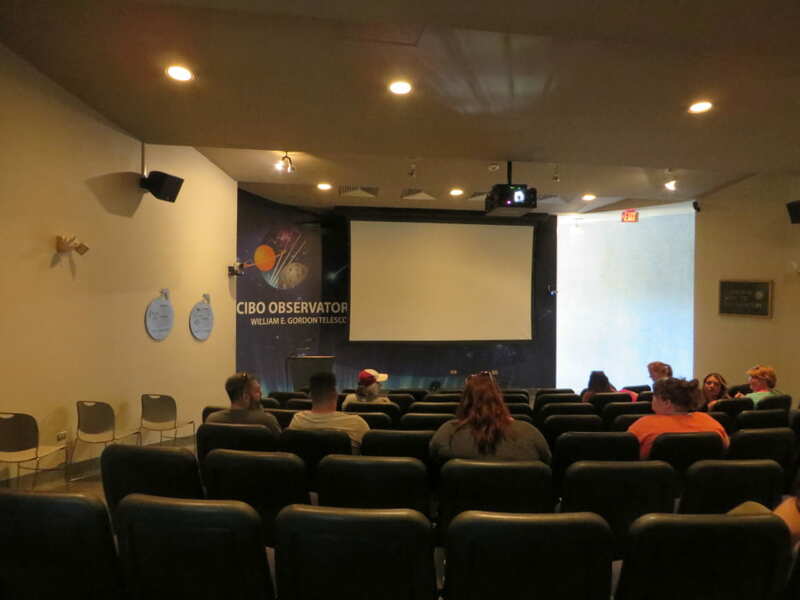 The visitor center is 2 stories, and has a theater. 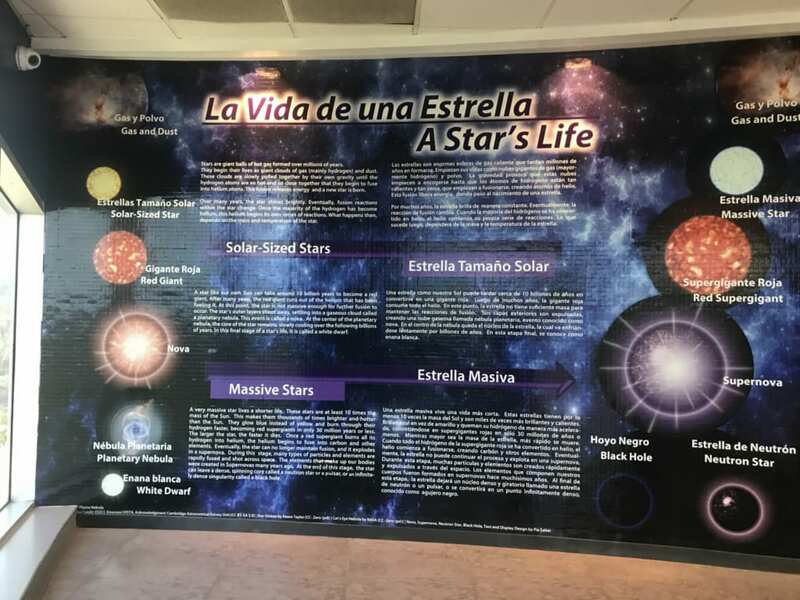 You can enjoy discovering what things have been studied at the Arecibo Observatory, and exhibits related to physics etc. 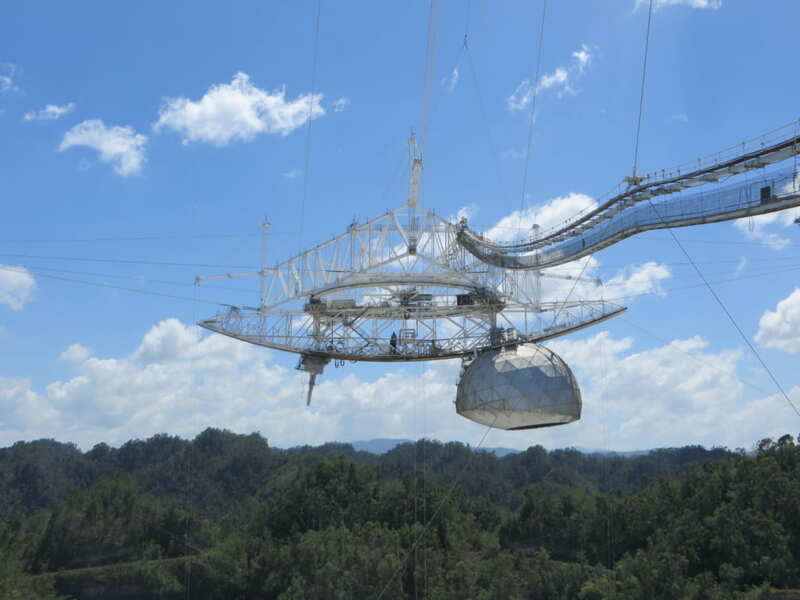 Well, I’m off to see the much talked of radio telescope. Outside I can see a mysterious object hanging from thick cables. There it is! Amaaaazing…! 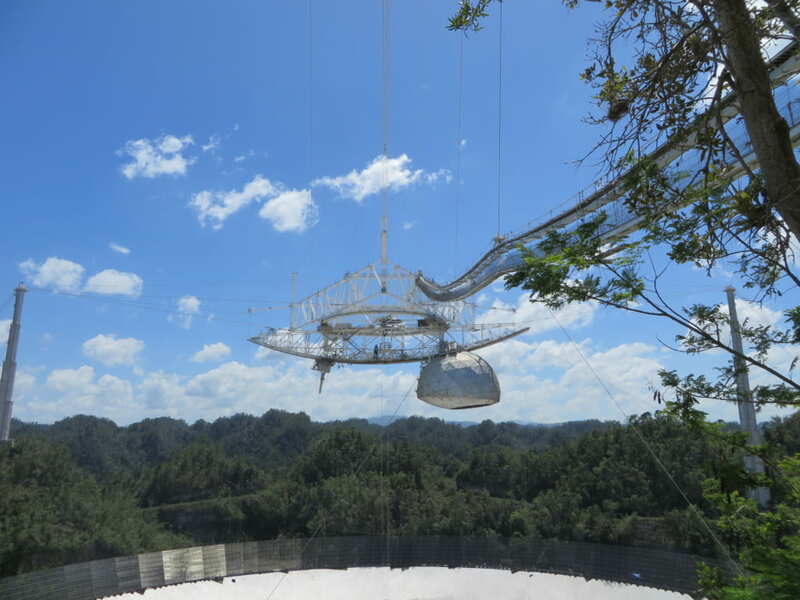 This is a radio telescope. 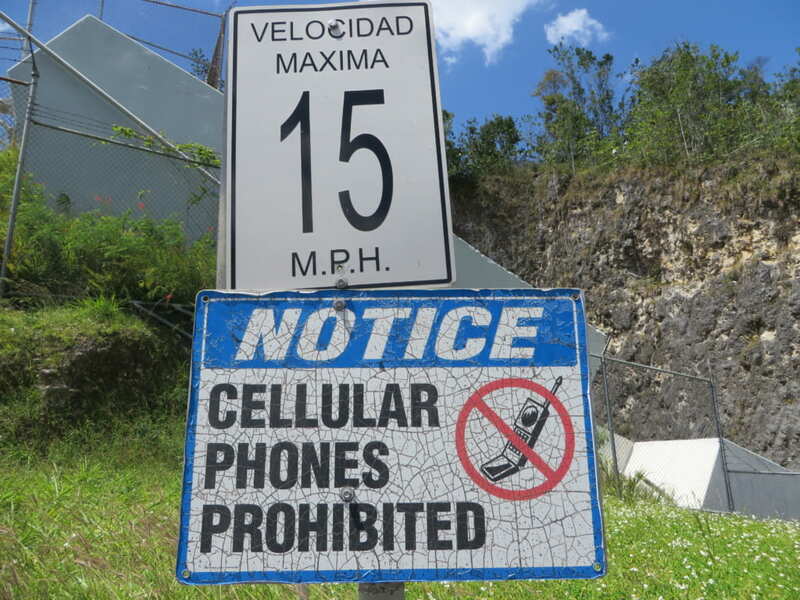 It is 150 meters above the ground. Zooming in, it looks like this. 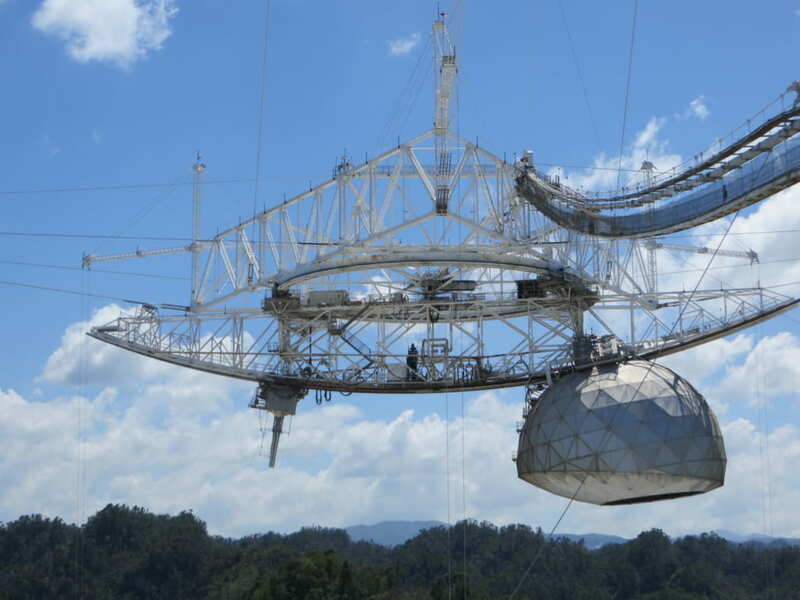 Oh boy, one of the world’s largest telescopes, I am impressed. 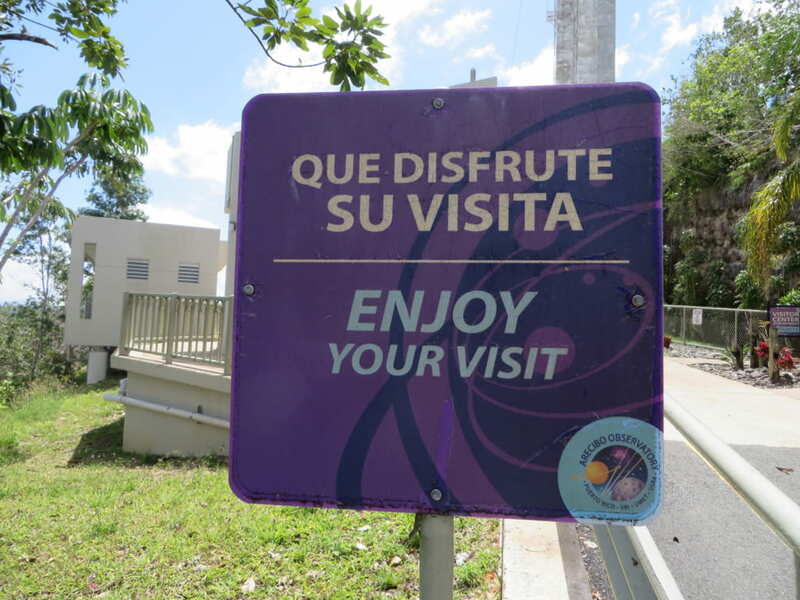 Some people might be thinking “haven’t I seen this somewhere?” Yes, the Arecibo Observatory is well known as the location for filming “007, Golden Eye” and “X Files (Season 2)”. The reflector under the radio telescope. There’s some conspicuous dirt and stains there. Maybe due to damage from long-term deterioration. 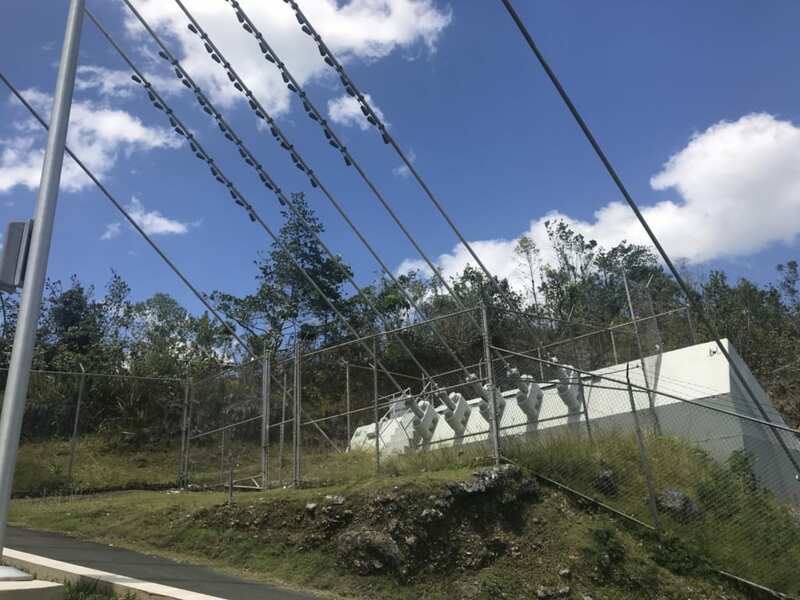 In the X-Files, it was the setting for an episode called “Little Green Men” where a signal was received from extra-terrestrial life forms at the Arecibo Observatory. This was related to the Arecibo message. It looks like pixel art, but it is a radio wave message that contains information such as the population of the Earth at that time. 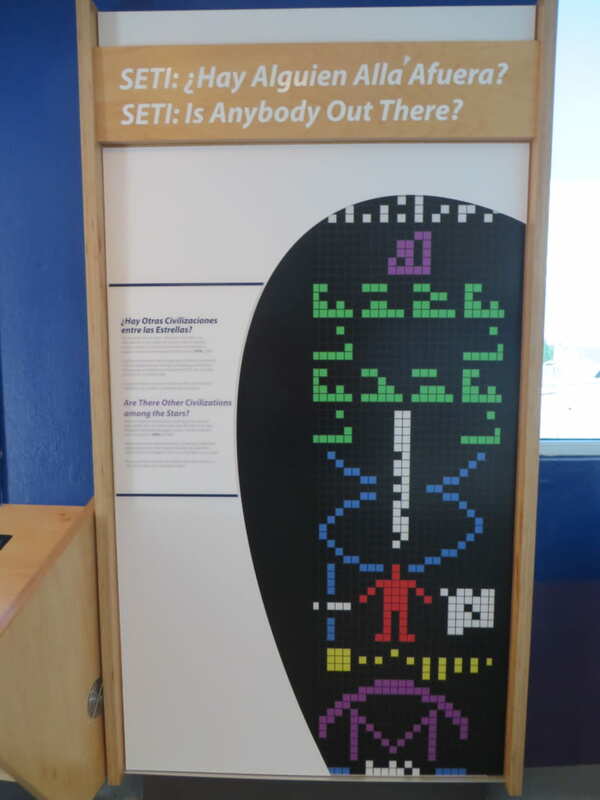 In the search for extraterrestrial intelligence, in 1974, it was sent from the Arecibo Observatory towards M13 (a globular star cluster) 25,000 light years away. However, it may take 25,000 years to reach M13, and there is no reply from the universe yet. 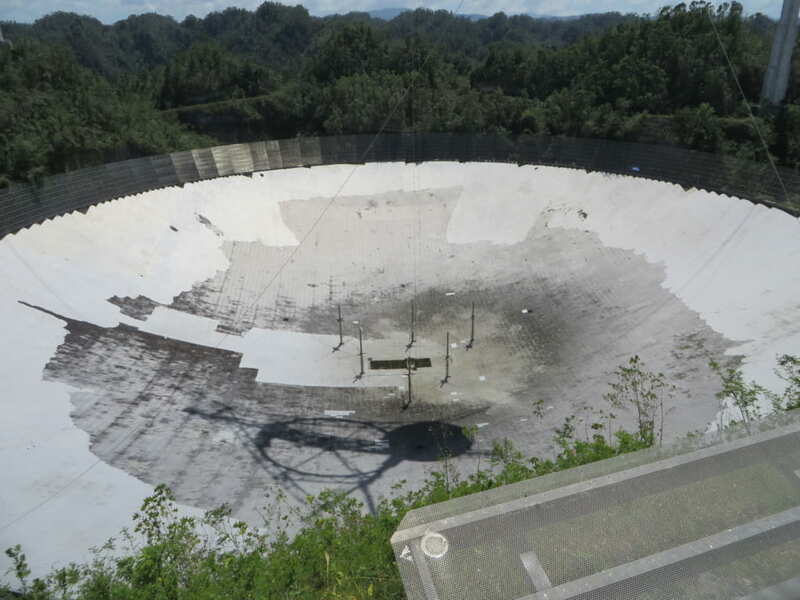 Although the facility is aging, I realized that the Arecibo Observatory is still waiting for a reply from outer space. 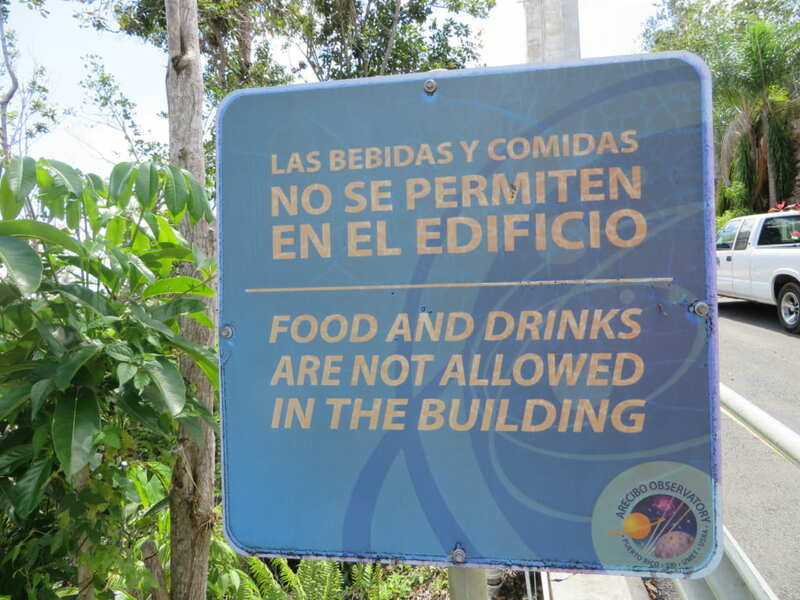 I came a long way to get to the Arecibo Observatory, so I decided to have a snack while looking at the radio telescope. 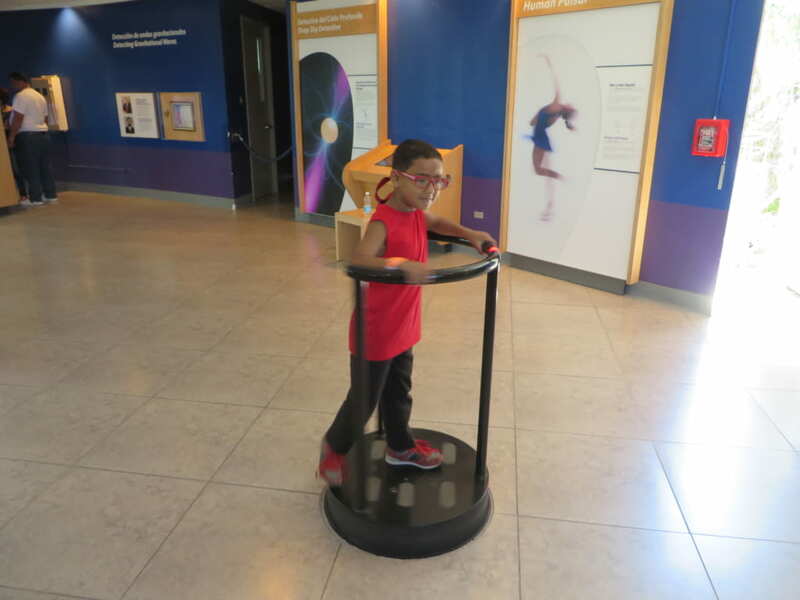 This is a ride-for-play, you can enjoy what its like to ice skate. Positively intoxicating (the experience.) Best done before eating. 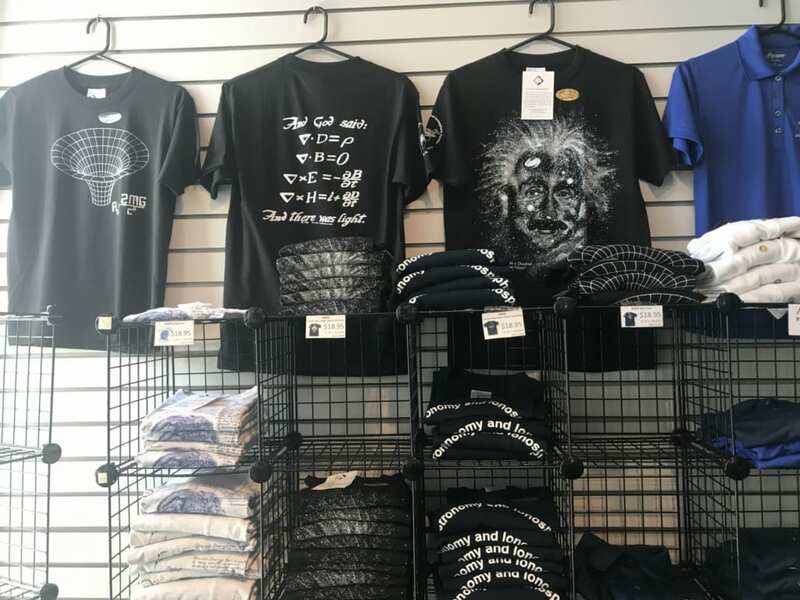 There is also a souvenir shop at the visitor center. 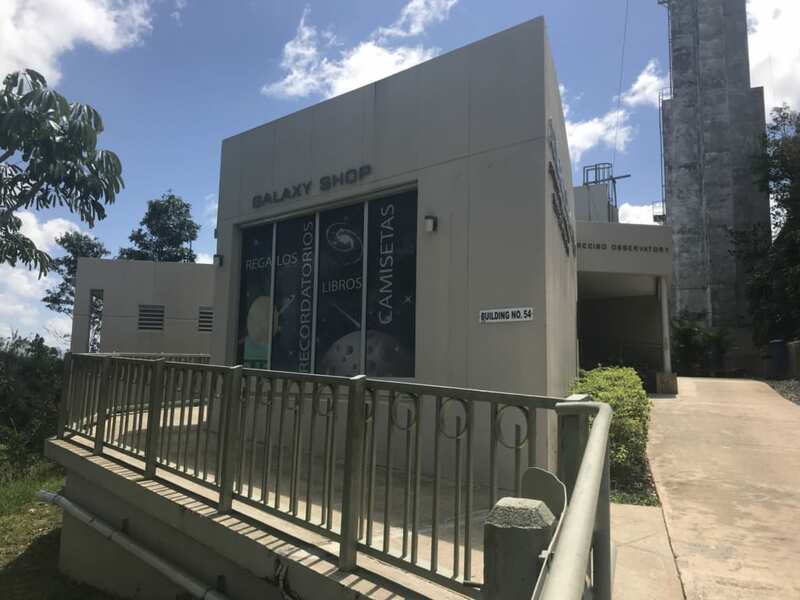 It’s called the Galaxy Shop. Goods that are available only here. If you visit, you must it check out. 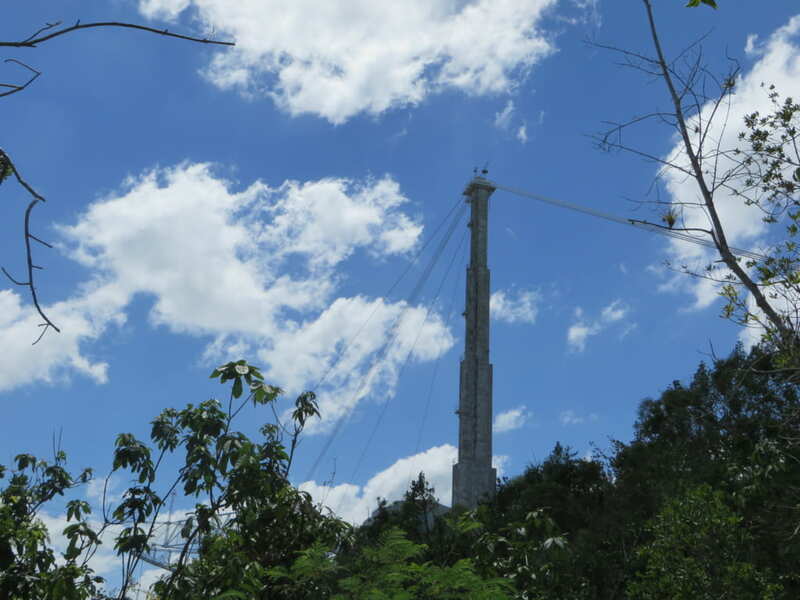 Actually, the Arecibo Observatory was scheduled to close in 2011. In November 2007, the annual budget of 10.5 million dollars was reduced to 8 million dollars from 2008, and the scheduled closure in 2011 was announced. 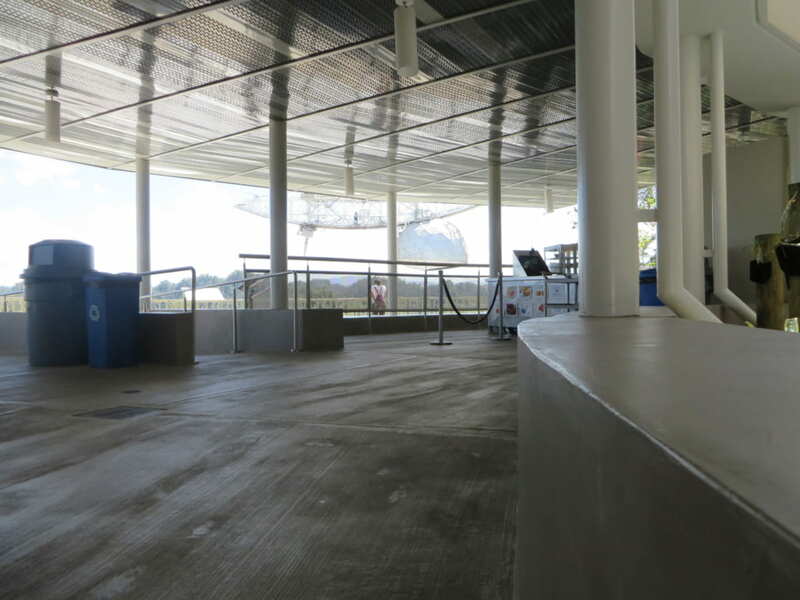 When I visited, nevermind Japanese tourists, there were almost no tourist at all in the Observatory. But if a reply comes from the universe, it will surely stay open. Aliens, if you are reading this, please reply as soon as possible. 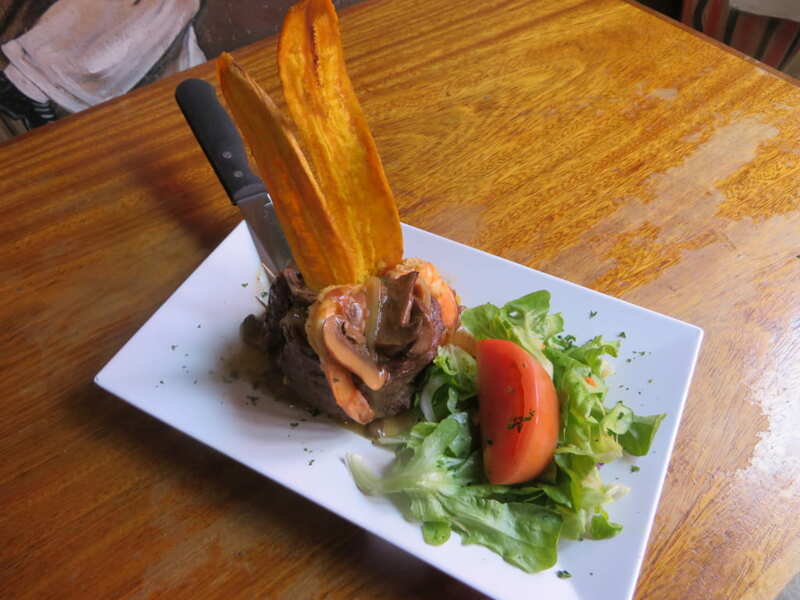 Puerto Rico has a kind of cuisine called Mofongo. 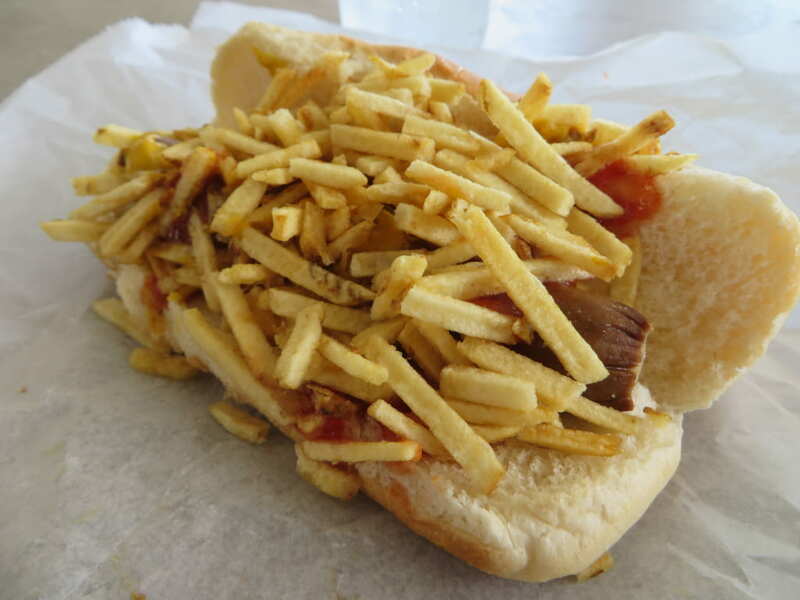 Generally, it refers to plantains, fried and then mashed, and then shaped into a ball to which condiments are added. 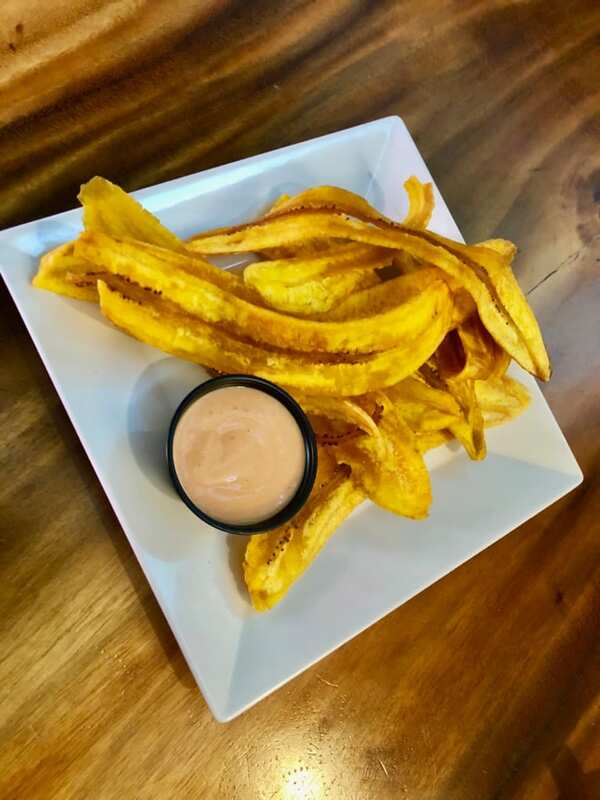 However, because the condiments differ according to the restaurant, if there are 100 restaurants, then it is no exaggeration to say that that there are over 100 different flavors of Mofongo. It looks like a movie set. 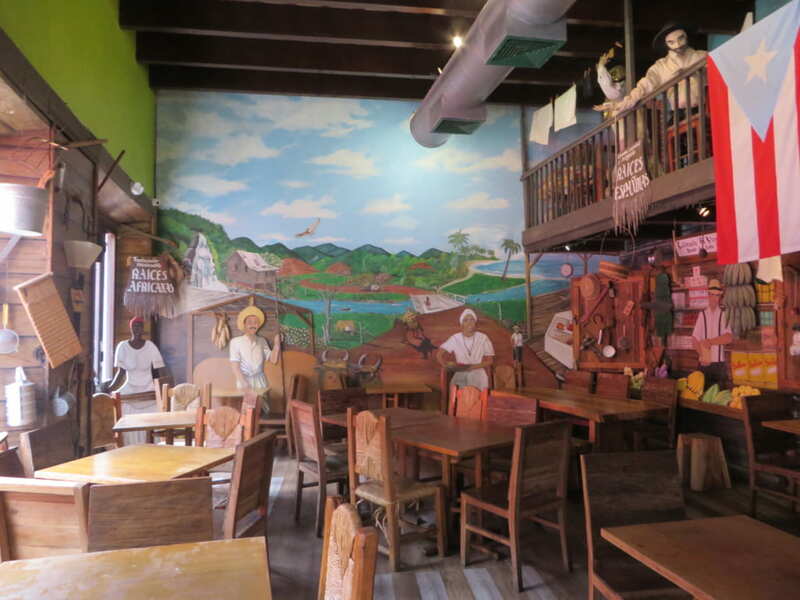 Mofongo was introduced by immigrants from Africa, so the paintings on the restaurant walls depict those roots. So, I showed the waiter the picture of the Mofongo that I wanted and my order was complete. It was not listed on the main menu. The first item to come out was a Banana Chips appetizer. These bananas are not sweet, they are deep fried plantains (like a green banana) dipped in a garlicy sauce. They look like damp potato chips and are very tasty. 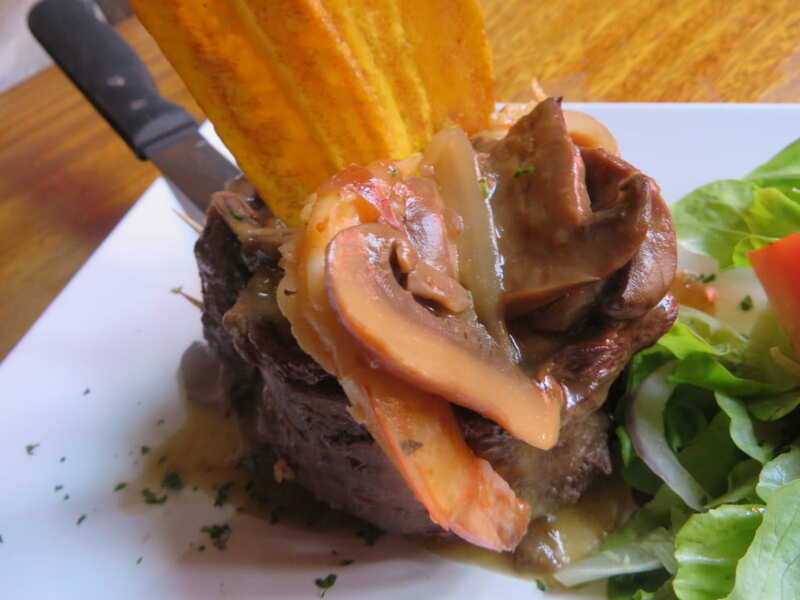 The Mofongo is packed with beef harami steak slices, covered in a rich mushroom and onion sauce that suits it perfectly! Tender shrimp is placed on top, leading to various textures in one dish. 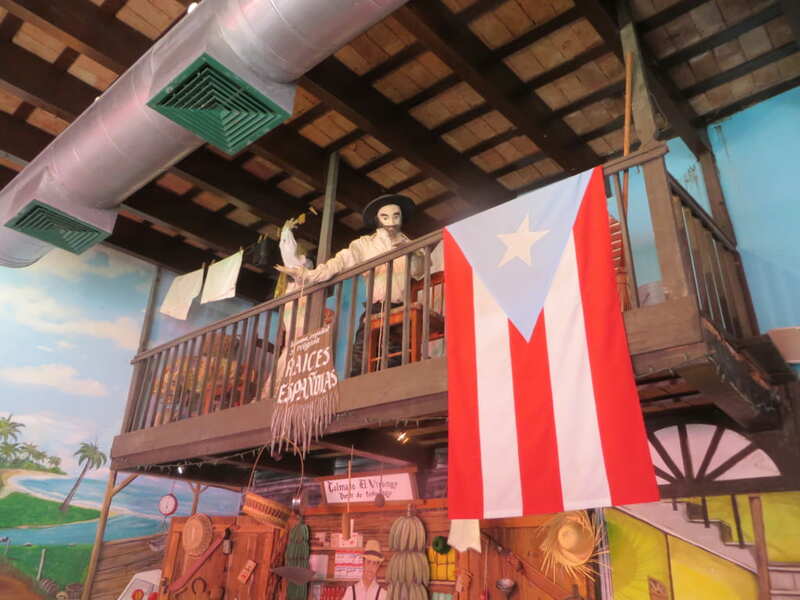 In Puerto Rico there are many opportunities to eat Mofongo, but this shop was exceptional. Also, there was a lot more volume than expected, so be careful if you are used to eating small meals. After my stomach was satisfied, I heard that the circus would be coming to a square in town. So, I quickly decided to go. By the time I got to the square, it was already dusk. The audience was overflowing. But it didn’t. Actually, the first performance was audience volunteers being asked to make sounds with the instruments. The circus man put a bell on his head to ring in rhythm with the music, and gave signals to the audience volunteers to play their instruments. 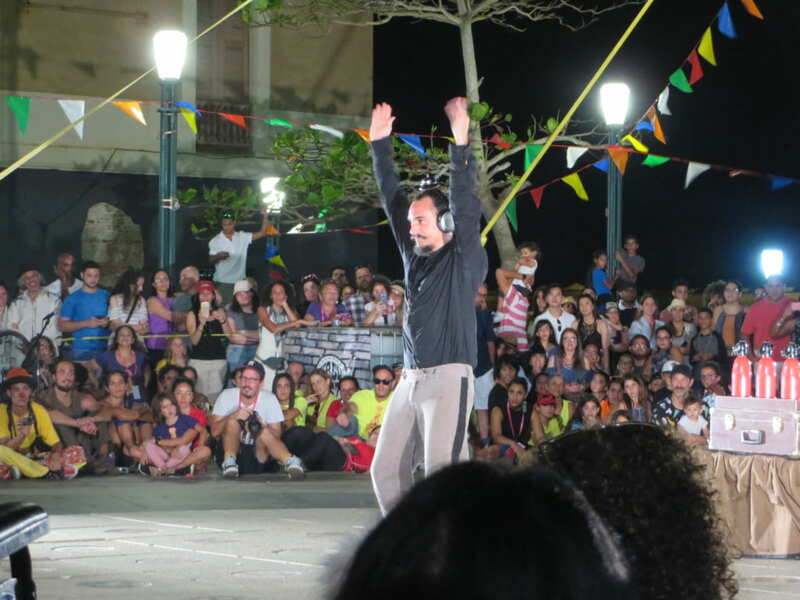 The whole square was filled with laughter at this Latin-style rhythm performance! There was nothing like you’d find at a usual circus, no bear riding a motorcycle, no-one getting stepped on by an elephant, no watching tightrope walkers with bated breath. 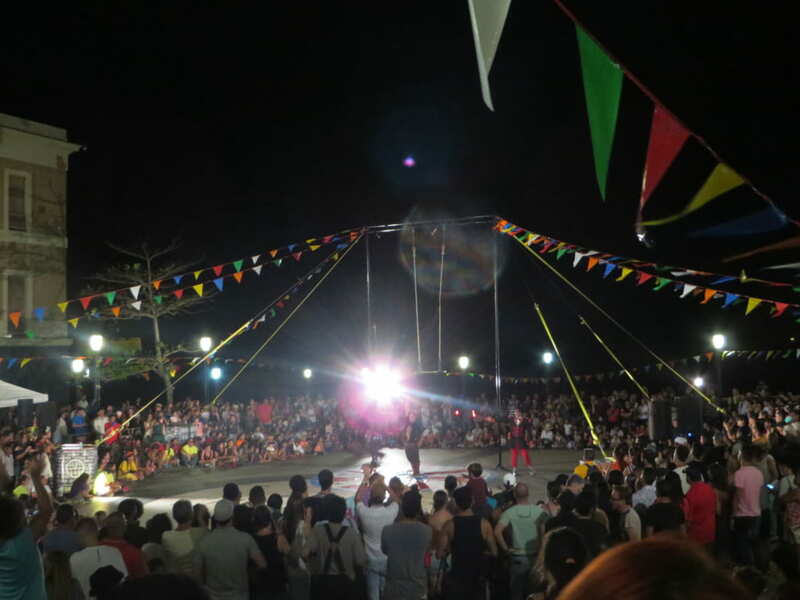 I guess this is more like a “Circus festival for local people to gather for fun.” Although it was not what I expected, I enjoyed a local experience that cannot be found in any guidebook. 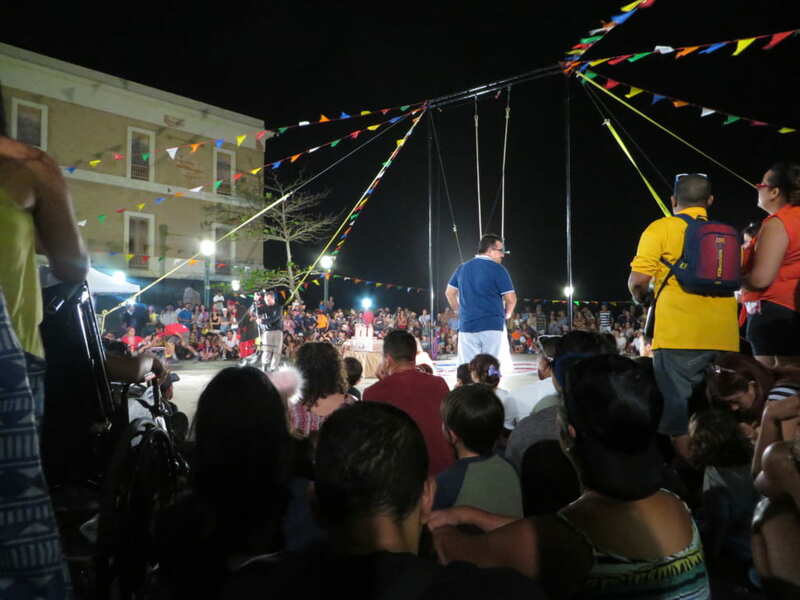 “If you come to Puerto Rico, you must have fun at night!” says the head of the Circo Fest. 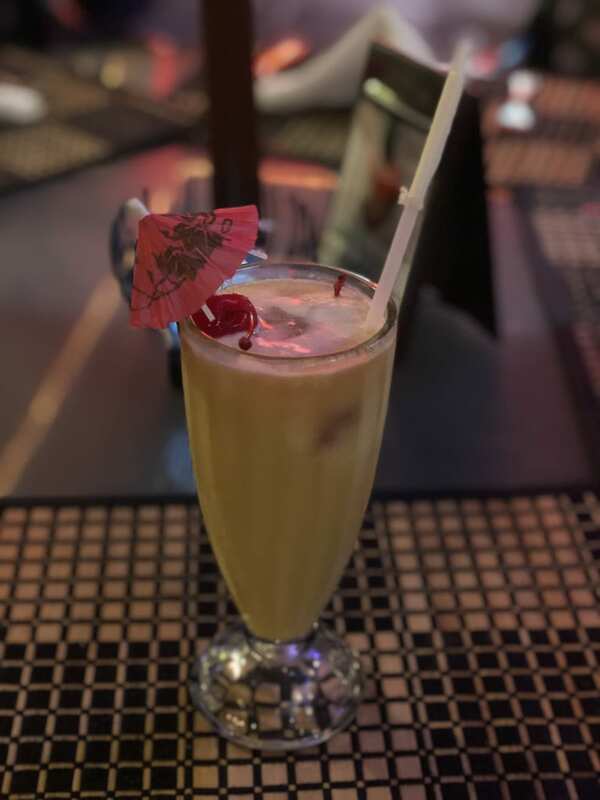 Have you ever heard of a cocktail called “Piña Colada”? It’s a cocktail based on rum, made by mixing coconut milk and pineapple juice. It feels good in your mouth with a very fruity taste, I think it has many fans regardless of gender. 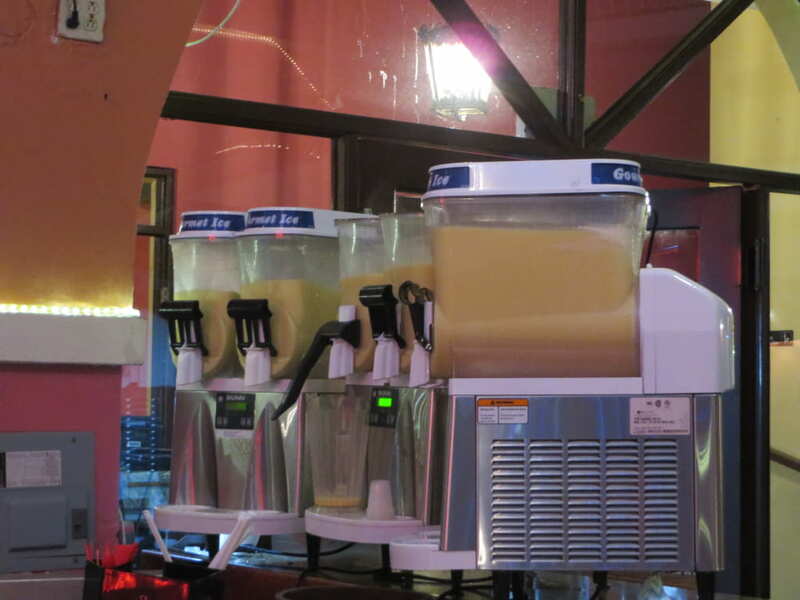 The birthplace of Piña Colada is Puerto Rico. 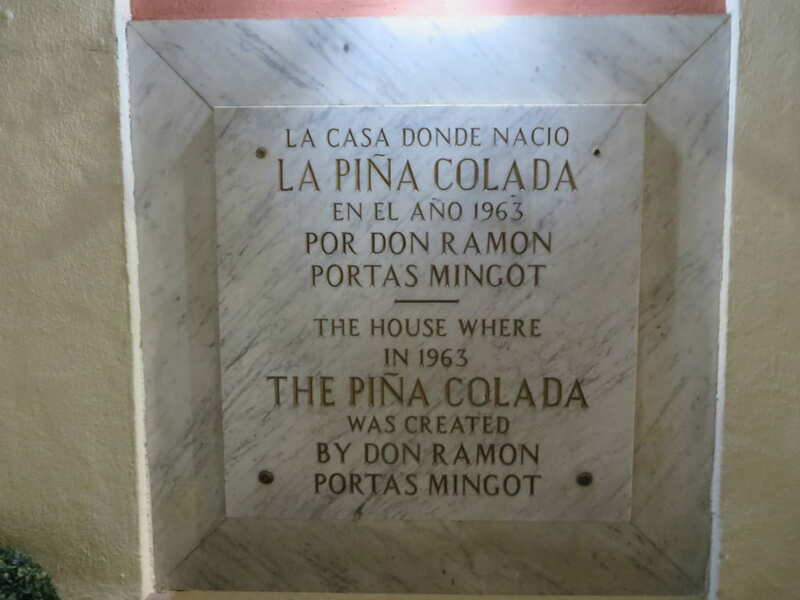 This “Piña Colada” shop is genuinely the original “Barrachina”. 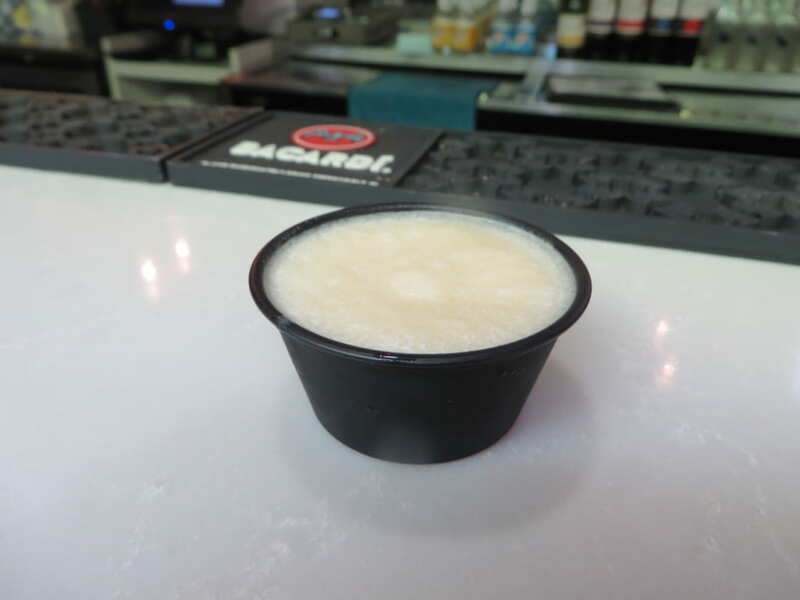 This is the Piña Colada. It even comes with a pretty tropical parasol and a cherry (7 dollars.) Its been partially frozen, so it cools you right down from the heat of the day. Also, you can get it without rum, so even people who don’t like alcohol or children can enjoy it. 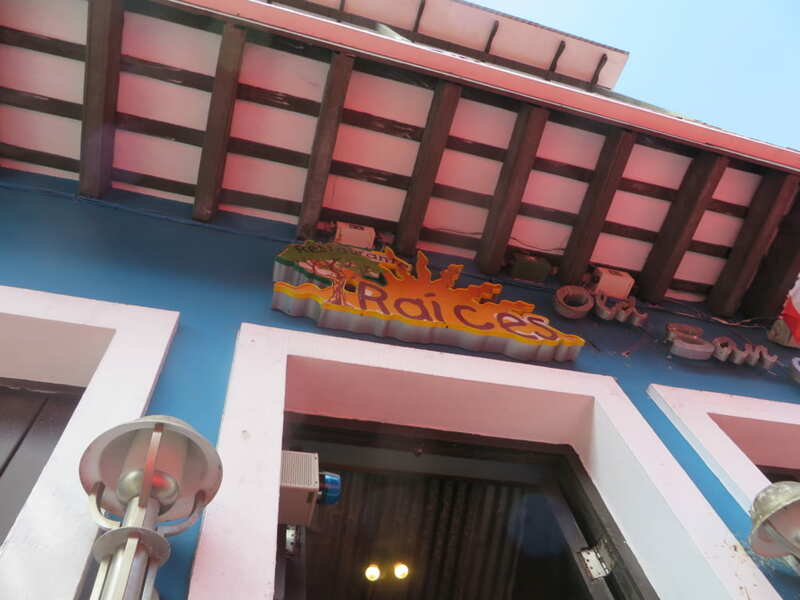 By the way, the restaurant where I ate Mofongo “Raíces” also served Piña Colada as a welcome drink. 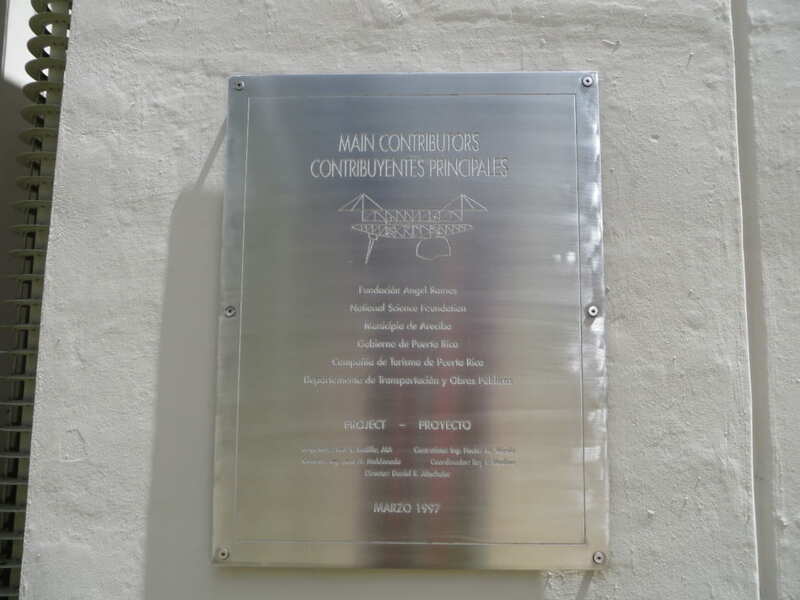 Outside the shop, there is a plaque to commemorate the original shop. With such an entrancing name “Piña Colada”. 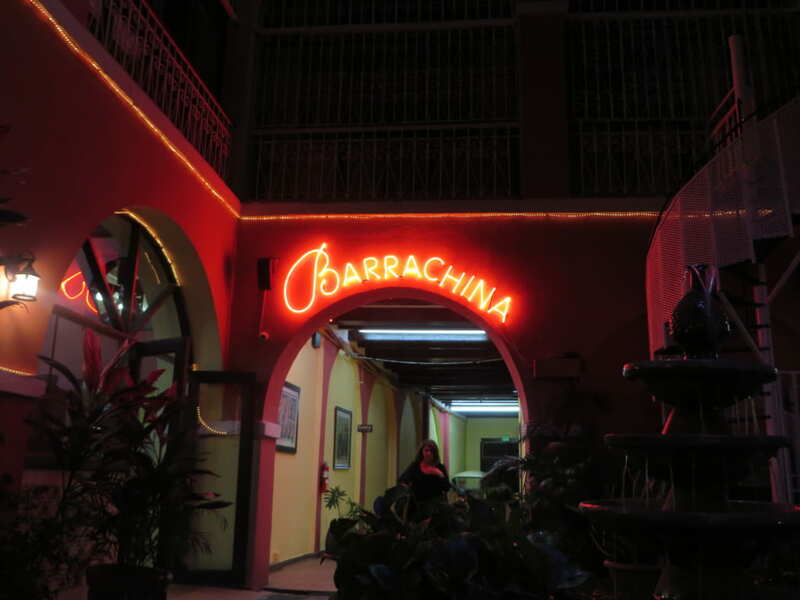 Why not give it a try one evening in Puerto Rico? 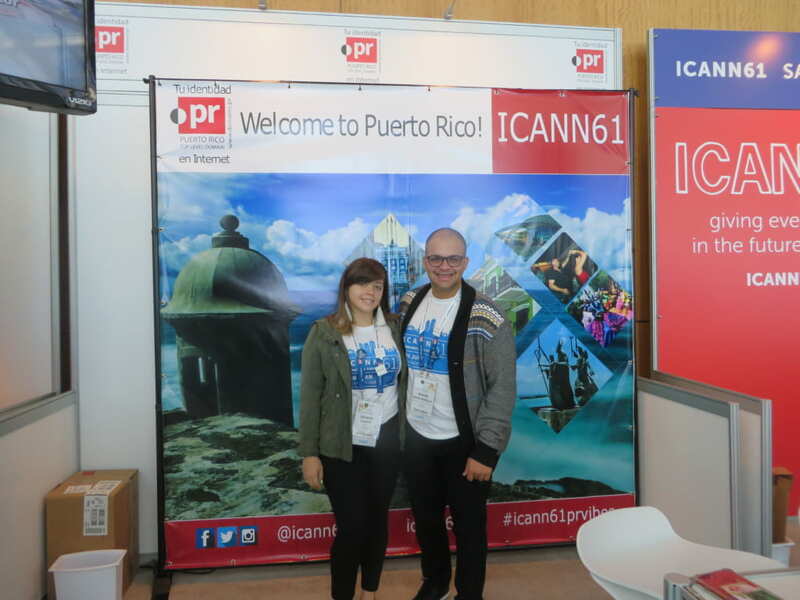 During my stay in Puerto Rico, the 61st meeting of ICANN was held between March 10th and 15th, 2018. 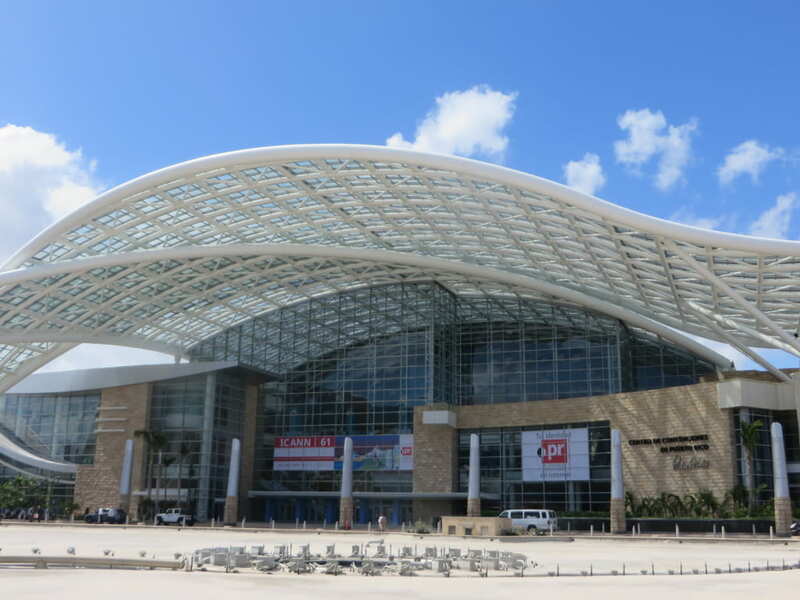 It was held at the Puerto Rico Convention Center, close to the Old Town, an exhibition hall that holds approximately 17,000 people. 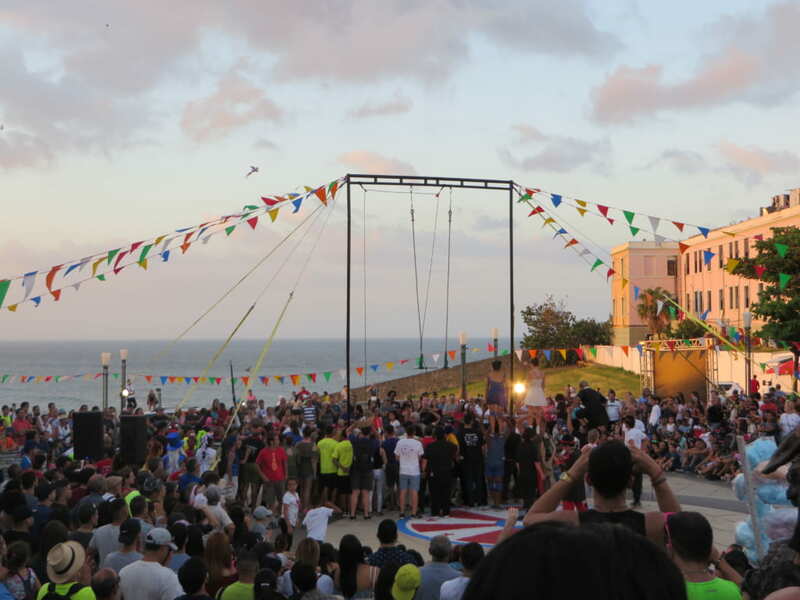 The opening ceremony. 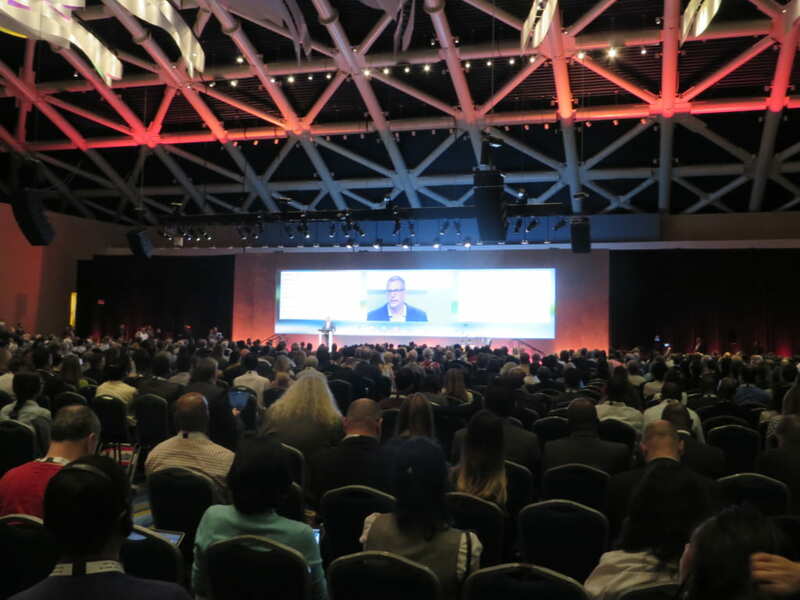 The speaker is ICANN CEO Göran Marby. 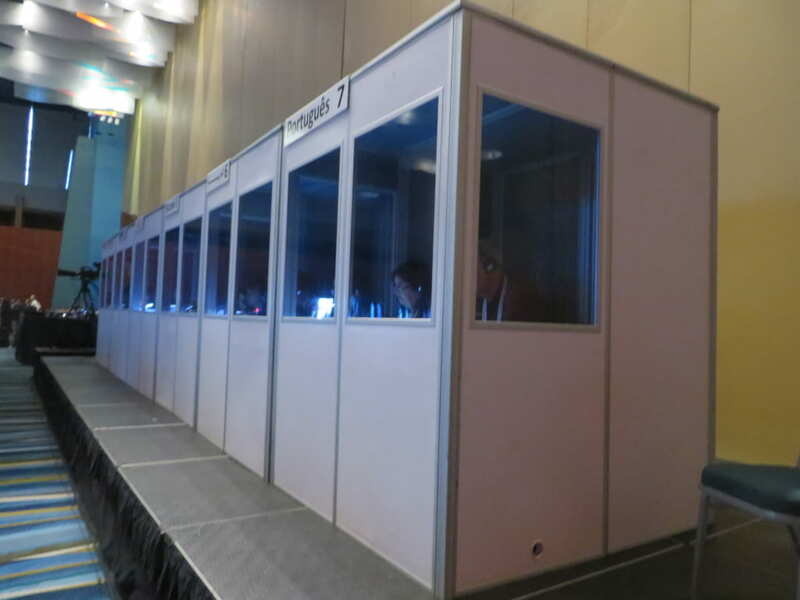 There were simultaneous interpreting booths in the venue, and Internet providers from all countries gathered. I could hear the conference in several languages, but not in Japanese. 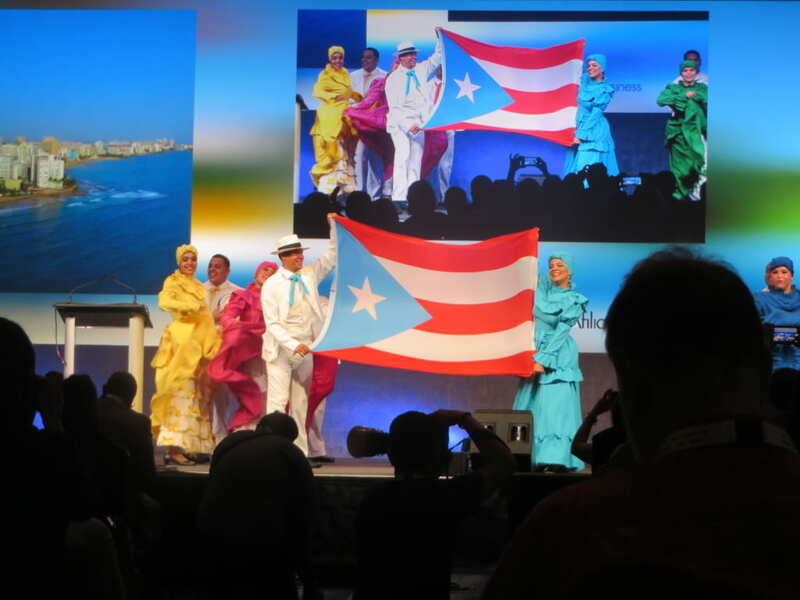 As an introduction to Puerto Rico, a traditional Salsa dance was performed. A burst of exotic splendor. After the opening ceremony, there’s a 5-day meeting with a specified program. 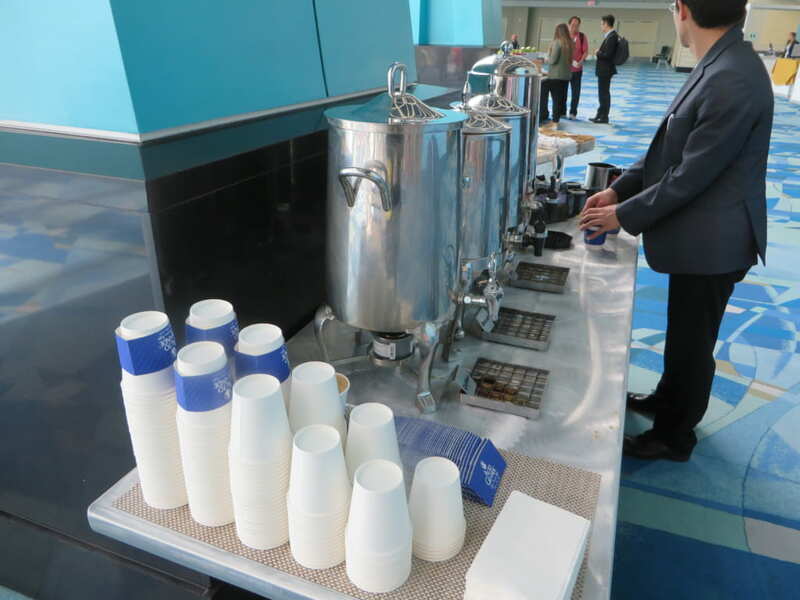 Once in the morning and once in the afternoon there is a coffee break. This is the drink corner. 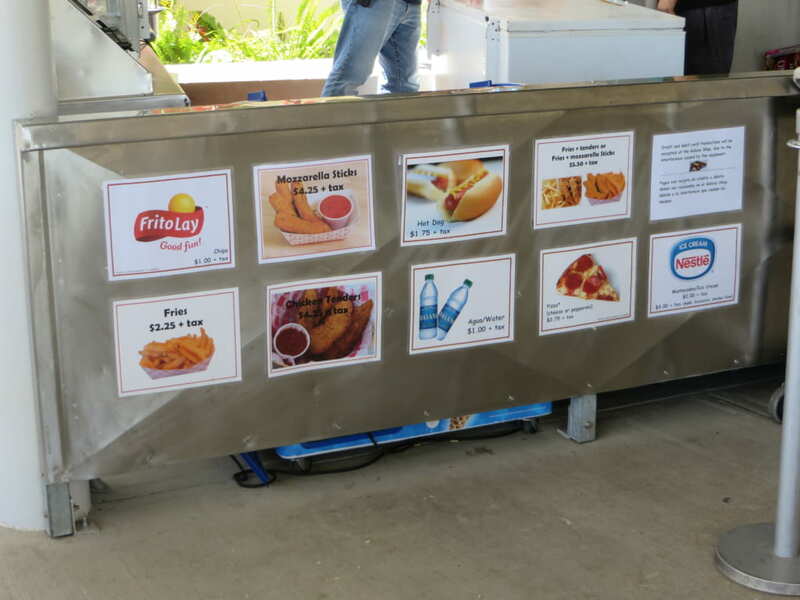 Next is the snack corner. 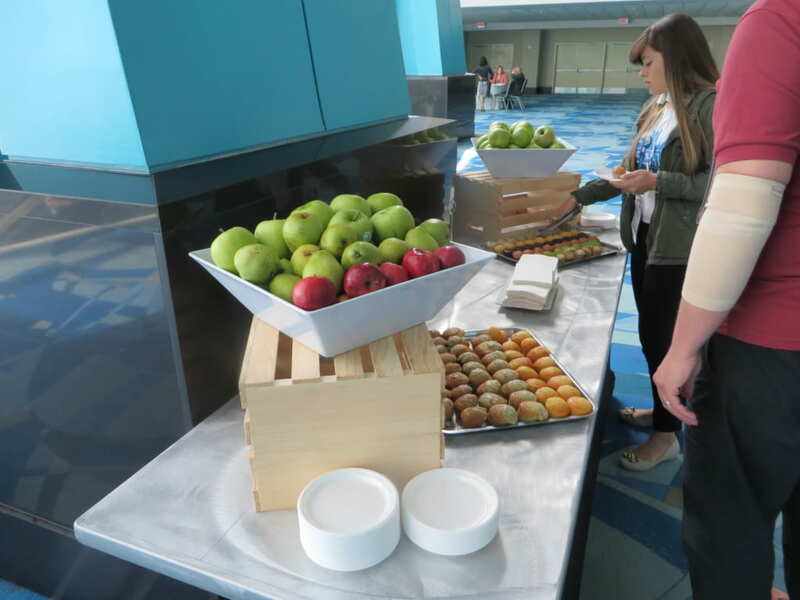 Fruits and pastries are lined up. Such breaks are common at overseas conferences, somehow it reminds me of Japanese carpenters. 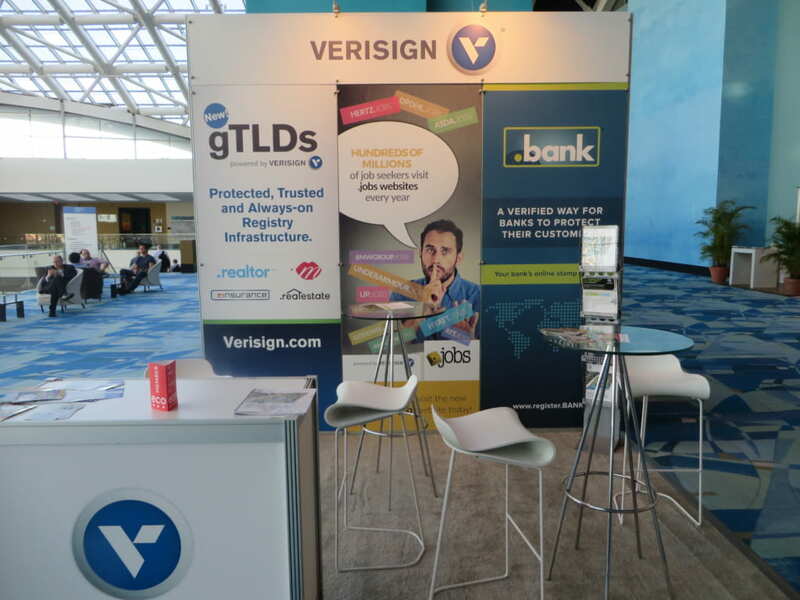 Some people return to their accommodations, others go to check out the sponsor booths. There’s a relaxed atmosphere. 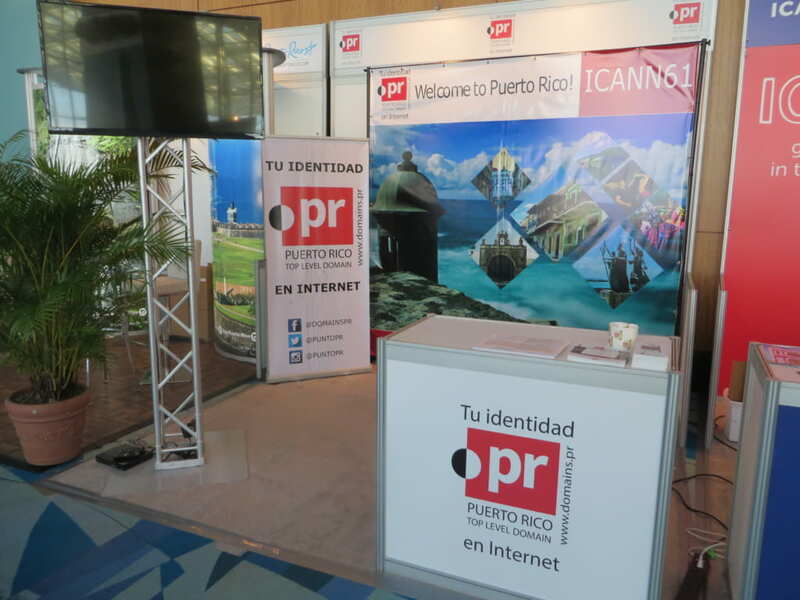 There are several types of domains (ccTLD) in Puerto Rico, such as “.pr”, “biz.pr”, “com.pr”, etc. 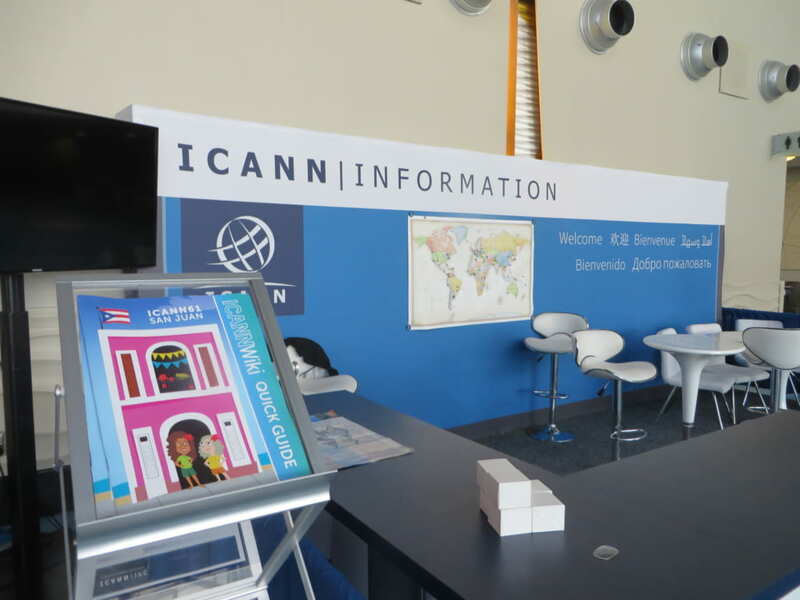 I visited the booth of the “.pr” domain name registry, the host of the 61st ICANN conference. 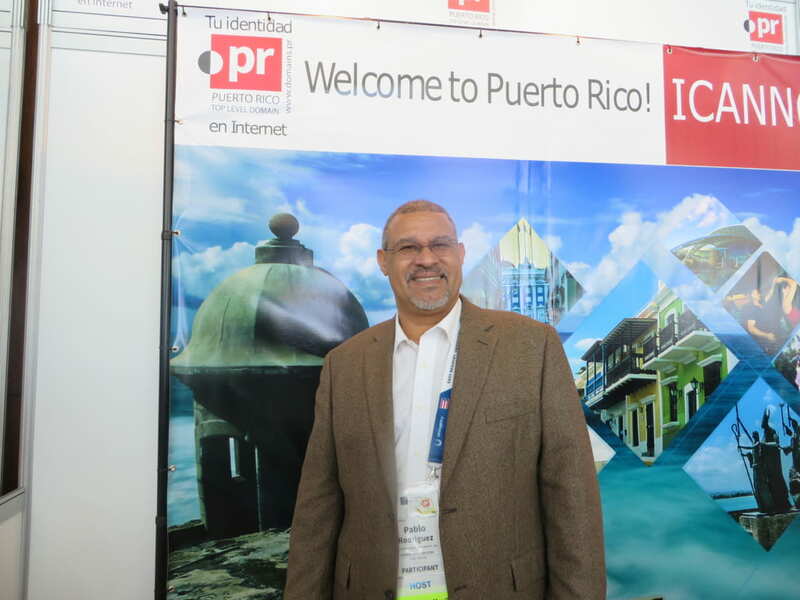 It’s Pablo Rodriguez, vice president of “.pr” domain name registry. “The price of the “.pr” domain is high, but it is a safe domain that is rarely used in spam!” he says. By the way, our registrar, Gonbei Domain, offers “.pr” domain registrartions at 162,000 yen (tax included – for 1 year). At the time of the Great East Japan Earthquake, I heard the “.pr” registry extended the renewal deadline to prevent expiration of the “.pr” domain as a relief measure to users in Japan, which suffered so much infrastructure damage. Also, the “.pr” domain, which was registered in 1989, celebrates its 30th anniversary in 2019. It is “.pr” which is often used as a domain to appeal to PR (public relations), so I’m looking forward to what sort of PR there will be.